US manufacturing has always been a substantial force of growth. In 1953, manufacturing accounted for 28% of the US economy. At its peak in 1979, manufacturing supported 20 million jobs. The slow recovery from the financial crisis has placed a burden on the growth factor once seen in this industry and forced US manufacturing production to become drastically more efficient. Today, the convergence of the real and digital manufacturing worlds is building the renaissance of manufacturing in America. But, What are smart factories? The smart factory is a shining, interconnected blend of production and data. The factory is a paradise of efficiency, encompassing process automation via a perfect integration of high-tech tools and high-tech workers collaborating, tracking intelligent analytics among dynamic systems and stages of the supply chain. This data can be used to generate adaptable manufacturing processes, for example by being flexible to real-time customer feedback or optimizing production rates. Defects and idle time hover around null; waste and waiting are forgotten issues. 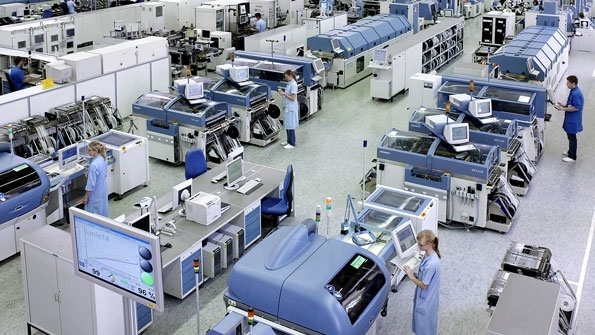 Smart factories reduce complexity (by focusing on design and streamlined manufacturing), are standardized (in their layout and processes), are flexible (a variety of products assembled), extremely efficient and reliable and have a high capacity (spending on assets, optimizing performance). It is the pinnacle of technological and manufacturing development, the seamless integration of the factory and business. Siemens’ operates approximately 130 manufacturing plants in the US. Siemens’ Norwood plant in Ohio, using hardware and software to modernize the factory, has increased capacity by 50% and productivity by 42% and reduced energy use by 40%. General Electric is also building smarter factories, such as the GeoSpring Hybrid Water Heater facility in Louisville, Ky., which combines high-tech, energy-saving technology with lean workflow to create an advanced, economical manufacturing operation. Others are following the examples of the above giants: SunPower, the SV-based photovoltaic manufacturer succeeded in reducing manufacturing costs over the past three years and cost reductions are not over yet. The new manufacturing plant (known as Fab 4) will enable SunPower to to drive higher cell efficiencies, and it plans to produce its first 23-percent-efficient X-Series panel by the end of 2015. There are other cost reductions in the pipeline. SunPower recently purchased a small California-based robotics engineering company called Greenbotics. This will enable it to cut water usage for cleaning by around 90 percent and lift its energy production at the same time. Finally Tesla recently announced details about its gigafactory and how critical cost reductions will be achieved through optimized manufacturing processes driven by economies of scale previously unobtainable in battery cell and pack production, by co-locating suppliers on-site to eliminate packaging, transportation & duty costs and inventory carrying costs, and by manufacturing at a location with lower utility and operating expenses. Tesla projects that the Gigafactory will employ about 6,500 people by 2020. Before reaching that critical step, Tesla will continuously improve capacities of its current factory in Fremont, with ambitious goals set out by Elon Musk of 100.000 cars produced in 2015 compared to the 35.000 in 2014. This will be achieved thanks to the modernization of its production chain. Today, 12 million Americans, representing 9% of the total workforce, work in manufacturing. There is little doubt that smart manufacturing will continue to play a crucial role in propelling this economy and bringing back largest manufacturers to the US.